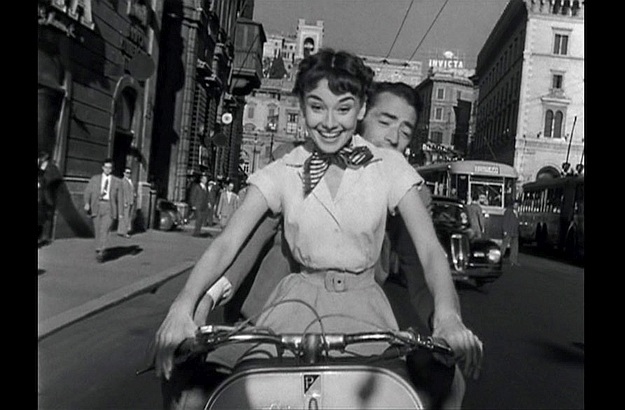 Audrey Hepburn on a Vespa, in the beautiful feature film “Roman Holiday”. Michele telling me about Pasolini’s film in the Pigneto neighbourhood. 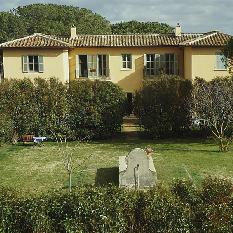 Via Margutta, where Joe Bradley, alias Gregory Peck, had his pied à terre. Rome and its grand Colosseum, as seen from my Scooteroma Vespa. 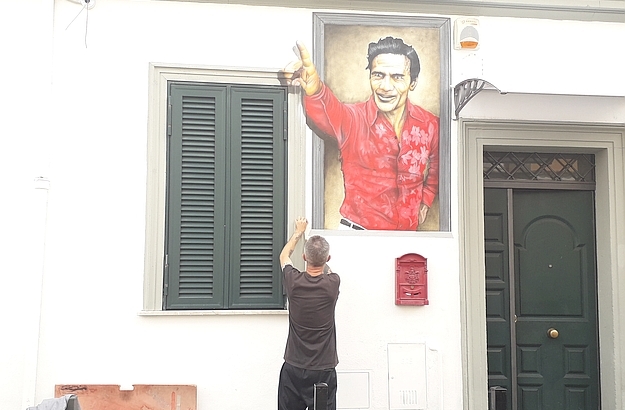 Inspired by Pier Paolo Pasolini: some Pigneto street art in the making. Annie and Giovanni, seen here with their Scooteroma expert team. Truth be told, I did not drive the scooter myself. 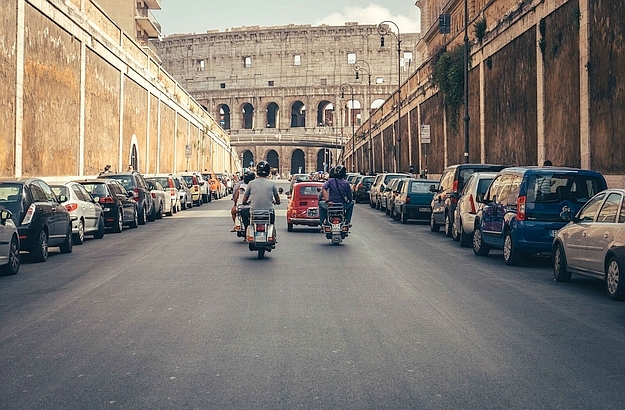 I hopped on the back seat and let Michele, a born and bred Roman, take me around town. 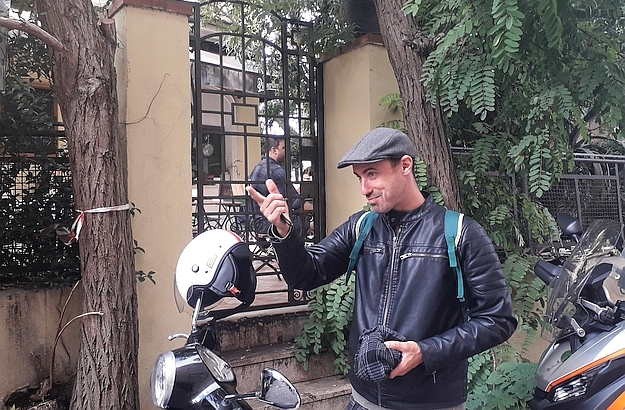 One of the expert guides of Scooteroma, Michele has been tackling Roman traffic and cobblestones, on two wheels, since he first drove to high school on a Vespa as a 14-year old. He later went on to study film-making, and now astutely combines his two passions, cinema and scooterism, by taking film buffs to famous and lesser-known movie locations in Rome. My tailor-made tour started in Via Margutta, downtown – where Joe Bradley, the reporter played by Gregory Peck in “Roman Holiday”, has his expatriate pied à terre –, and took us all the way to Pigneto, the Roman working-class neighbourhood where Pier Paolo Pasolini filmed his masterpiece “Accattone”. 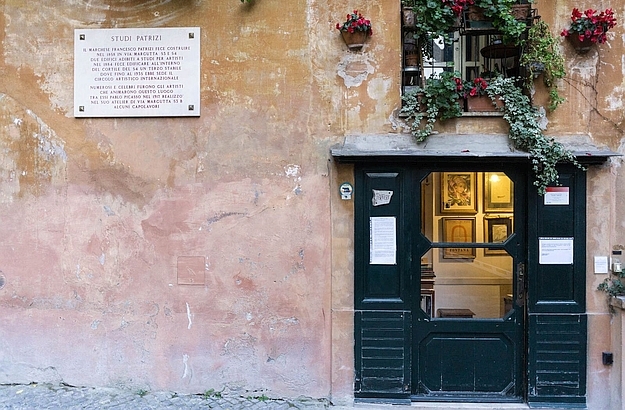 After our dazzling tour, Michele dropped me off at what happened to be, coincidentally, another film location: Santa Lucia, a restaurant located right behind the Piazza Navona, and where one of the scenes of “Eat Pray Love”, a 2010 American feature film, was shot with Julia Roberts. I had arranged to have lunch there with the founder of Scooteroma, Annie Ojile, who runs many of her business operations from a table in the restaurant – pretty much after the fashion of Federico Fellini, who used to hold office at bar Canova in the Piazza del Popolo. Annie’s great-grandfather migrated to the United States from the region of Molise in Southern Italy, where the owners of Santa Lucia hail from as well. When I tasted the delicious pear salad which Annie recommended, I understood that the reason she had picked this restaurant probably went far beyond mere family connections! Scooteroma offers tours on Vespas (which you can choose to drive or not), as well as on Piaggio Ape cars, for families. And if you’re just visiting for the day, Annie and her guides will be pleased to pick you up at the train station and drop you off right in the city centre.